Israel Folau's injury means the Wallabies need to find a fullback replacement. 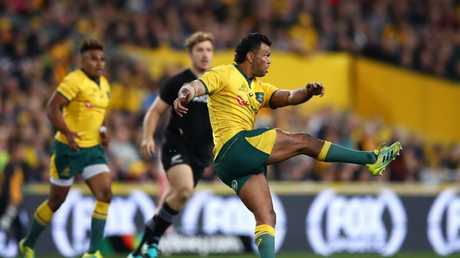 ISRAEL Folau's injury has left Wallabies coach Michael Cheika with a huge decision to make ahead of Saturday's must-win Bledisloe Test against the All Blacks at Eden Park. Since debuting on the right wing against the British and Irish Lions in 2013 and playing the next four matches in the position, Folau has worn the No.15 jersey on 61 occasions and missed just eight Tests. In seven of the eight Tests he's missed (rested three times, injured once, sabbatical four) Kurtley Beale has played in the fullback position, including in all four Tests during last year's Spring Tour. 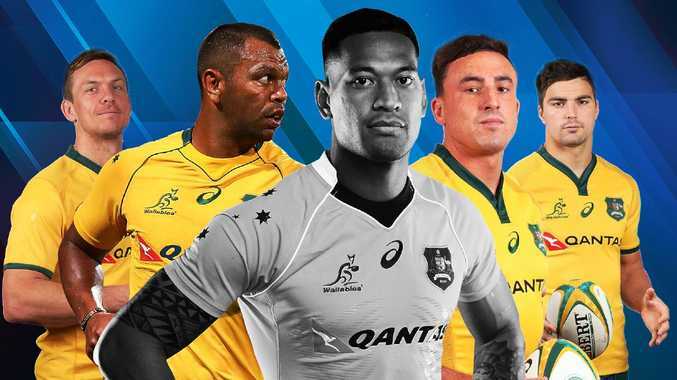 But Beale isn't the only option to fill Folau's jersey, after the three-time John Eales Medallist limped off the field midway through the second half of the Wallabies' 38-13 loss in the first Bledisloe Test with an ankle injury which is expected to see him miss just the one Test. Asked whether Jack Maddocks, who made his debut in the loss, would fill the void left by Folau, Cheika said he was in the mix. "I thought he did OK when he went on out there," Cheika said. "I haven't had a good look at it. "But he wouldn't have been on the bench if we didn't think he was ready to play. "So he played tonight and got a few touches, which was good, I think he got a try as well. "I would imagine that he would be there. "We've also got Tom Banks who has been with the squad and is an out-and-out fullback, so we'll see where we end up with it." But Maddocks and Banks aren't the only options. Here are the four contenders to wear the No 15 jersey for the Wallabies on Saturday against the All Blacks at Eden Park. Kurtley Beale has played 31 Tests for the Wallabies at fullback and was nominated as World Player of the year in 2010. He's worn the No 15 jersey for the Wallabies on 31 occasions and in 2010, when he started in the position on 10 occasions, Beale was nominated for World Player of the year. Beale also started in the position in the 2011 World Cup semi-final loss against the All Blacks at Eden Park and was one of the Wallabies' best that tournament. Last year, when Folau was on sabbatical, Beale shifted from inside centre to fullback for the Spring Tour. Beale wasn't mentioned by Cheika during his post-match press conference as a contender for the position but he's the favourite to play in the position. If Beale was to be shifted from No 12 to No 15, Matt Toomua would come off the bench into the starting XV at inside centre. At times Beale's been suspect under the high ball but his experience, solid right-foot boot and pace would see the Wallabies remain a threat at the back. He could also still slot into the playmaking positions from fullback when he wants too. Dane Haylett-Petty has played 22 Tests on the wing for the Wallabies. He had a tough night in Bledisloe I on the wing but Haylett-Petty is an out-and-out fullback and a good one too. Unfortunately in the 22 Tests Haylett-Petty's played, he's been stuck out on the right wing with Folau used at fullback. The 29-year-old from South Africa would be a safe option for the Wallabies at fullback. He's reliable under the high ball, generally kicks well and often beats the first man in contact. What he also has is a fullback's instinct. However, if Cheika shifts Haylett-Petty from the wing to fullback he'll be on the search for another winger and that, too, could be problematic with no clear standout. Jack Maddocks makes a break against the All Blacks in Bledisloe I in Sydney. The 21-year-old looked comfortable on his debut for the Wallabies. He scored a try, was safe under the high ball and made a crucial interception out on the right wing. Indeed, he earnt some praise from Cheika post-match for his sound display. But there's a difference between coming off the bench midway through the second half in Sydney and starting in the No.15 jersey at Eden Park, a venue the Wallabies haven't beaten the All Blacks at in 32 years. Maddocks played the majority of the year for the Rebels on the wing but was used at fullback when Haylett-Petty was out injured. There is a school of thought, though, that Maddocks remains suspect in defence and he does have the habit of tackling too high and being bumped away. However, by selecting Maddocks at fullback Cheika wouldn't need to shuffle other players and could keep Toomua on the bench. The Brumbies fullback was considered unlucky to miss out on the No.23 jersey against the All Blacks. He missed out because of Maddocks' ability to cover a number of positions. 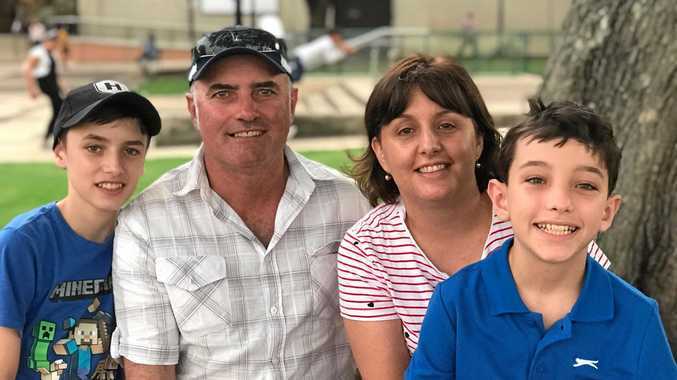 Banks enjoyed his best season yet in Super Rugby this season and was a standout in the Wallabies' internal trial ahead of the Bledisloe Cup where he made two breathtaking try-saving tackles and scored a try too. What separates Banks from many others is his raw pace. There are few faster over 100m than the Brumbies fullback and that is something the Wallabies do lack. But it would be a risk throwing an uncapped player into one of the toughest pressure cookers in world rugby. Maybe that's what the Wallabies need though? A youngster, who is blessed with genuine X-factor and not carrying the scars of defeat like so many in the current team.